A systematic approach to optimize the photocatalytic activity of BiOBr nanoparticles was investigated and compared. The resulting BiOBr powders were successfully synthesized through two different pathways: stirred solvothermal and stirred hydrothermal processes under identical synthesis conditions of temperature and time. The composition, morphology, structure and optical properties of as-prepared samples were characterized by means of X-ray diffraction, scanning electron microscopy with energy dispersive X-ray spectroscopy, transmission electron microscopy, diffuse reflectance UV–Visible spectroscopy. Effective surface areas of the synthesized samples were estimated by Brunauer–Emmett–Teller studies. Catalysts prepared by solvothermal process and named (S-BiOBr) were of hierarchical microspheres, while the hydrothermally prepared ones called (H-BiOBr) were nanoflakes, both with a pure crystalline phase. The photocatalytic activities of as-synthesized structures were then examined to evaluate the effect of the synthetic route on the degradation of methyl orange (MO) dye as an organic compound model under simulated solar light irradiation (250 W Xenon lamp, 300 ≤ λ ≤ 800 nm). The photodegradation of MO was monitored by UV–Visible spectroscopy, substantiated by total organic carbon analysis. Hydrothermal process was a non-template method while in solvothermal route ethylene glycol has been used indicating the relative effects of the relationship of medium viscosity on morphology. 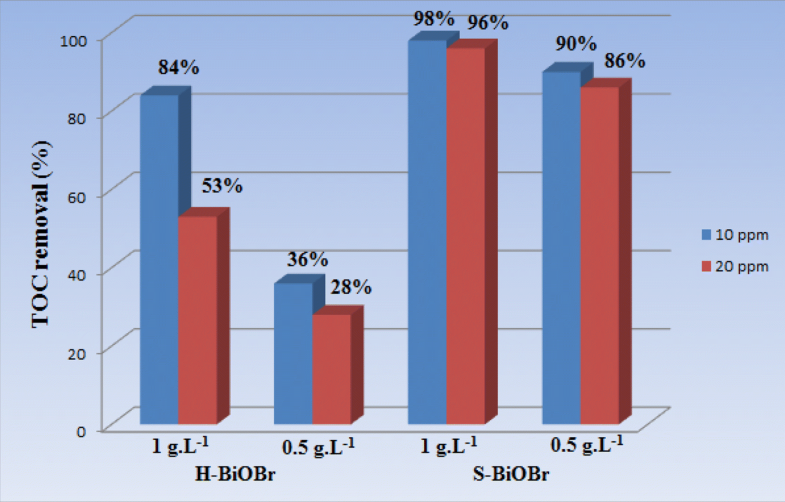 On the basis of such analysis, the degradation efficiency of S-BiOBr towards MO was found to be 97% compared to 56% using H-BiOBr for 20 ppm concentration of dye. 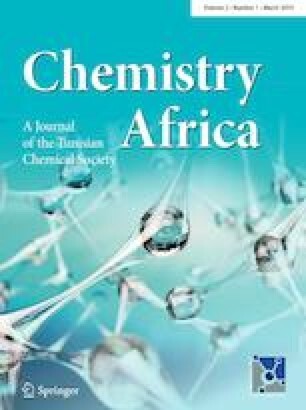 The kinetic analysis confirmed that the reaction rate constant kapp was nearly 3 times higher than that of H-BiOBr, suggesting that S-BiOBr displayed the highest photocatalytic activity for the effective decomposition of MO. In the past decade, environmental remediation and solar energy have aroused extensive interest for the removal of various organic pollutants from wastewaters. Actually available water treatment technologies such as adsorption, ultra-filtration and coagulation concentrate the pollutants, creating secondary pollution [1, 2, 3]. That is why, semiconductors photocatalysis has emerged as a promising process for wastewater treatment [4, 5, 6]. Up to now, the most prevalent photocatalyst is TiO2 that can be activated by just ultraviolet light, which forms merely 5% of total solar radiation . In theory, the electron–hole pairs created by band gap excitation of the latter lead to redox chemical reactions such as pollutant degradation [8, 9]. Regardless of its worth, some intrinsic inconveniences such as limited light absorption due to wide band gaps and charge carrier recombination, prevent its effectiveness . Therefore, the development of efficient visible-light-driven photocatalysts has become more attractive since visible light accounts for 43% of the solar spectrum . In order to use visible light and solar energy efficiently, a variety of heterojunctions have been developed to improve quantum efficiency, extend light absorption to visible regions and/or coupling with other narrow band-gap semiconductors, so numerous works done in this field were performed with TiO2 , CdS , ZnO , Bi2O3 , MoO3 , CeO2 , to name a few, and along their composites with carbonaceous materials [18, 19, 20, 21, 22]. In recent years, bismuth oxyhalides (BiOX = Cl, Br, I), a group of V–VI–VII semiconductors have been investigated with regard to their superior optical properties and potential applications in photocatalytic degradation of organic compounds [23, 24, 25]. Among BiOX photocatalysts, bismuth oxybromide (BiOBr) is particularly important owing to its unique optical, luminescent and stability properties under visible light irradiation [26, 27]. Indeed, BiOBr crystallizes in a tetragonal matlockite structure, a layer structure characterized by [Bi2O2] positive slabs interleaved with double bromide atom slabs to form [Bi2O2Br2] layers along the c axis . In addition to the intrinsic crystal structure, the photocatalytic activity is enhanced enormously by various parameters such as particle size, specific surface area and morphology which depend on the synthetic route. There are numerous methods for synthesizing BiOBr particles [28, 29, 30, 31, 32, 33, 34, 35]. Among them, hydrothermal/solvothermal processes appear as the most widely used ones. Treatment parameters for each these methods vary widely. For example, reaction temperature, treating time, pH of medium and bromide precursor products via either template or template-free approaches may vary from hydrothermal method to solvothermal one leading to a wide range of particle morphologies, size, crystallinity, phase purity etc. and consequently reach various conclusions [36, 37, 38, 39, 40, 41, 42, 43]. However, to the best of our knowledge, there is no report in the literature on BiOBr synthesis via hydrothermal/solvothermal routes under the same apparatus and operating conditions. The aim of the present work is to compare two different synthesis pathways of BiOBr particles: Stirred-assisted hydrothermal process and stirred-assisted solvothermal process using an autoclave introduced into a shacked furnace at the same working temperature, time and bromide precursor. Then, physicochemical differences that can be induced are evaluated looking for a relationship between these methods. Furthermore a considerable attention was coordinated to thoroughly assess photocatalytic performance of BiOBr structures on the degradation of methyl orange as a target pollutant under simulated solar light irradiation. Bismuth nitrate pentahydrate Bi(NO3)3.5H2O (ACS reagent, 98%), potassium bromide KBr (ACS reagent, 99%), Ethylene glycol C2H6O2 (EG, 99%), Methyl Orange C14H14N3NaO3S (ACS, C.I. 13025), and acetic acid (CH3COOH) were used as received without further purification. Double distilled water was used in the experiments. BiOBr powder was synthesized using a template free hydrothermal process, using an autoclave introduced into a shaked furnace. Typically, 0.970 g of Bi(NO3)3.5H2O was dissolved in 5 mL acetic acid and then added to 35 mL distilled de-ionized water containing 0.238 g KBr under vigorous stirring for 20 min at room temperature according to desired molar ratio (Bi/Br = 1). The mixture was then poured into the autoclave under continuous shaking and heated at 160 °C during 6 h, then cooled to room temperature. The resulting powder was repeatedly washed with ethanol and distilled water to remove any possible ionic species in the product, and then dried at 50 °C. This sample was called H-BiOBr. BiOBr particles were prepared by solvothermal process using an autoclave introduced into a shaked furnace. Initially, 0.238 g KBr was dissolved in 40 mL solution of ethylene glycol (EG) and then 0.970 g of Bi(NO3)3.5H2O was added to the above mixture under magnetic stirring for 20 min at room temperature according to desired stoichiometric ratio (Bi/Br = 1). The suspension was transferred into the autoclave under continuous shaking and heated at 160 °C for 6 h, then cooled to room temperature. The precipitate obtained was washed thoroughly with ethanol and distilled water and then dried at 50 °C. The obtained powder was named S-BiOBr. X-ray diffraction (XRD) patterns were recorded on a Panalytical X’Pert diffractometer using with Kα radiation (λ = 1.5408 Å) in the range of 2θ = 10-70° with 0.002° increment. Scanning Electron Microscopy (SEM) images were taken on a MultiSungs LCD1970Nxp Quanta 600 Scanning Electron Microscope. The component of the as-prepared samples was detected by energy dispersive X-ray spectrometry (EDX). Transmission electron microscopy (TEM, JEOL-1011 microscope, operating at 80 kV) was performed to observe the morphologies and nanostructures. The UV–Vis difuse reflectance Spectra (DRS) of the samples were obtained in the range of 200 – 800 nm using a UV–visible spectrophotometer (LAMBDA 1050). The Brunauer–Emmett–Teller (BET) surface area and pore volume of the photocatalysts were determined by nitrogen adsorption–desorption isotherms obtained at − 196 °C using a Quadrasorb SI Model 4.0. Total organic carbon (TOC) measurements were monitored by a Shimadzu 5000-A TOC analyzer. The photocatalytic activity tests of samples were evaluated by degrading methyl orange (MO) in aqueous solution under simulated solar light irradiation. 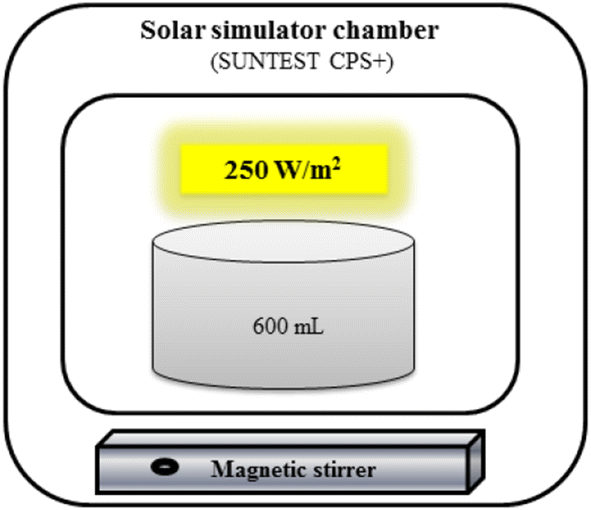 The system consisted in a borosilicate reactor (750 ml) with a wider shape inside a solar simulator chamber (SUNTEST CPS +) with a Xe lamp at the top of the chamber (300-800 nm; 250 W/m2, photon influx 6.5 e−4 Einstein/min) as shown in Fig. 1. In each experiment, the reactor was loaded with an aqueous solution of MO (10 ppm, 20 ppm) with the desired amount of catalyst (0.5 g/L, 1 g/L). Then, the reactor was placed inside the solar box and remained under irradiation for 240 min with continuous stirring. Prior to the irradiation, the suspension was stirred for 30 min in dark to reach the adsorption–desorption equilibrium between the dye and the catalyst surface under ambient air-equilibrated conditions. During irradiation, at given time intervals, 3 mL of suspension was sampled and centrifuged. Dye concentration was determined using a Scinco S-3100 UV–Visible spectrophotometer and the characteristic absorption peak of MO at 464 nm was used to determine the extent of its degradation. Figure 2a, b shows the XRD spectra of BiOBr powders obtained by the two pathways. All the diffraction patterns can be attributed to the tetragonal phase BiOBr within space group P4/nmm, which are in good agreement with the literature [34, 35]. The sharp reflection peaks are indexed corresponding to the standard data obtained from JCPDS card no. 73-2061. In this equation, D is the average crystallite size, R is the Scherrer constant (0.89) related to the crystallite shape, λ is the wavelength of X-ray (1.5408 Å), θ is the Bragg angle, and β is the line broadening at half the maximum intensity ((FWMH), radians). Here, the XRD results reveal that crystallite size obtained by stirred-assisted hydrothermal process are smaller compared to that reported in other works [35, 46], this may be due to the effect of agitation during the hydrothermal treatment which provides more uniform distribution of temperature and concentration . As depicted in Fig. 2b, the main diffraction peaks position of S-BiOBr powders can be attributed to (001), (101), (102), (110), (110), (200) and (212) reflexions, implying a well crystallized material and lack of other phases . The intense peak appears at the (110) position suggesting growth in that direction . The average crystal size for S-BiOBr microspheres in these operating solvothermal conditions (160 °C, 6 h) estimated by the Scherrer’s Eq. (1) is 12.8 nm, which is smaller than that found in the literature . It appears that stirring seems to have an effect on the BiOBr crystallite size as well for hydrothermal and solvothermal processes . Scanning electron microscopy is used to examine the morphology of the as-prepared powders. According to Fig. 3a, BiOBr particles obtained by hydrothermal synthesis reveal agglomerated platelet-like shape due to electrostatic interactions. Higher magnification SEM image (the inset of Fig. 3a) exhibits assembled flakes/plates with smooth surface, low thickness and an average particle size approximately of 2-4 μm. It is noticed that the morphology of BiOBr particles synthesized by solvothermal method using ethylene glycol as solvent is different compared to that obtained by hydrothermal route. Figure 3b shows hierarchical microsphere morphology with an exterior rough surface and an average diameter ranging from 2 to 5 μm indicating a clear polydispersity, since no other morphologies are observed. Closer inspection of the image (the inset of Fig. 3b) exhibits hierarchical microspheres composed of diverse ultrathin lamellar structure showing a porous texture. The chemical composition of the as-prepared samples is also observed by EDX. Figure 3c and 3d depict the presence of O, Br and Bi elements, the presence of carbon peak can be ascribed to the carbon tape used in EDX analysis. The results of EDX analysis are consistent with XRD analysis, and reveal that both H-BiOBr and S-BiOBr are pure phase without any other impurities. The determined atomic ratio of Bi to Br for H-BiOBr and S-BiOBr is 1.09 and 1.27, respectively, which is closed to nominal value of 1.00 and within the uncertainty of the instrument. TEM images shown in Fig. 4a and 4b verify that H-BiOBr display irregular plates while S-BiOBr are of hierarchical microspheres consisting with numerous nanoplates densified to each other. As illustrated from Fig. 5, it seems clear that in identical operating conditions of temperature and time (160 °C for 6 h) with KBr as bromide precursor, the nature of solvent is the main parameter that controls the morphology of BiOBr particles. Indeed, many research works have examined this effect and demonstrated that uncommon shapes appear when the synthesis is performed in organic medium [38, 39, 40, 41]. A particular characteristic of bismuth is its unique coordination chemistry, which induces unsymmetric geometries. Thus, structures frequently exhibit intense distortions, leading to anisotropic physical properties . In regards to solvothermal method, EG coordinates with Bi3+ through the formation of bismuth alkoxides as a product which makes the nuclei for the growth [48, 49, 50, 51, 52]. In the presence of bromide salt (Br−), the reaction proceeds into autoclave reactor stirred at 160 °C for 6 h. Then, with the increase of reaction time, the nuclei grew anisotropically into ultrathin lamellar structure which promotes deviation through the assembly process leading to 3-D microspherical BiOBr architectures. Figure 6 a and b show UV–Vis diffuse reflectance spectra (DRS) of H-BiOBr and S-BiOBr products. Both samples exhibit significant increase in photoabsorption lower than 470 nm (Fig. 6a) implying that these photocatalysts are active under visible light which is in accordance with literature . where n depends on the characteristics of the transition in the semiconductor and is equal to 4 for BiOBr crystal, α, h, ν, Eg, and A are absorption coefficient, Planck constant, light frequency, band gap, and a constant, respectively . By extrapolating the linear region in the Plots of (αhν)1/2 versus photon energy (hν) as shown in Fig. 6b the band gap energies are about 2.9 eV and 2.82 eV for H-BiOBr, and S-BiOBr, respectively. The slight shift is may be due to the confinement effect . The nitrogen adsorption–desorption isotherms of both samples H-BiOBr and S-BiOBr are presented in Fig. 7. According to the IUPAC classification, the on record isotherm of H-BiOBr is type II (Fig. 7b), specifying macroporous nature that we believe produced by interaggregated BiOBr flakes/plates as confirmed by SEM analysis, thus we observe one hysteresis loop. As for S-BiOBr, the nitrogen adsorption–desorption isotherms is classified type IV (Fig. 7a) with a visible hysteresis loop at high relative pressures (P/P0 = 0.6 – 1.0) characteristic of mesoporous structure. This feature is typically associated with capillary condensation phenomenon of nitrogen adsorption in the mesopores produced by assembled nanoplates . The corresponding pore size distributions of BiOBr powder are presented in Fig. 8. For S-BiOBr microspheres, the pore size distribution shows a maximum centered peak around 10-12 nm (pore diameter), while the observed pore diameter for H-BiOBr flakes/plates are located between 4-6 nm. The total volumes of pores for H-BiOBr flakes/plates and S-BiOBr microspheres are 0.029 and 0.089 cm3 g−1, respectively. The Brunauer–Emmett–Teller (BET) specific surface areas (SBET), Pore Diameter (Dv(d)) and Pore volume (VBJH) of H-BiOBr and S-BiOBr powders are summarized in Table 1. The BET specific surface area of S-BiOBr (24.46 m2 g−1) is higher than that of H-BiOBr (3.27 m2 g−1), owing to the presence of large mesopores with pore diameters of ca. (10-12 nm) as seen by (BJH) method. These large pores are resulted as indicated above during the assembly process under EG which improve the aggregation of flakes/plates into 3-D hierarchical microspheres. The photodegradation of MO under simulated solar light irradiation (λ = 464 nm) was used as a probe to evaluate the performance of the as prepared photocatalysts. The temporal evolution of the UV–Vis absorption spectra in various times during the photocatalytic degradation ([MO] = 10 ppm) mediated by S-BiOBr and H-BiOBr photocatalysts (0.5 g L−1) are illustrated in Fig. 9. 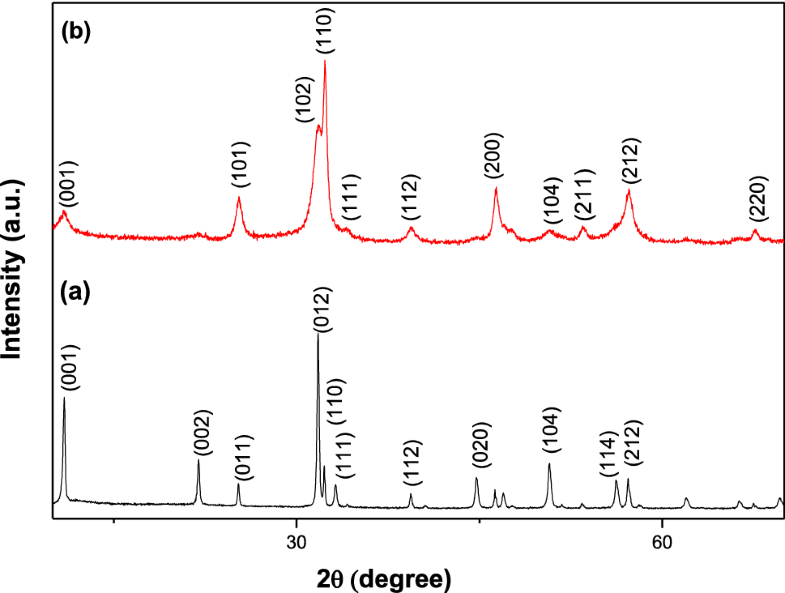 The intensity of absorption peaks decreases progressively, and the initial orange color of the MO solution gradually turned to light-colored readily for S-BiOBr photocatalyst (Fig. 9b) indicating that S-BiOBr reveals higher photocatalytic aptitude. The concentration change C/C0 of MO aqueous solution (λ = 464 nm) is proportional to maximum absorbance value (A/A0) obtained from UV–vis spectra. As shown in Fig. 10 a and b, it can be observed that S-BiOBr shows higher photocatalytic activity at each catalyst dosage 0.5 g L−1 and 1 g L−1 for both initial concentration of MO aqueous solution 10 and 20 ppm. where C0 is the initial concentration of MO aqueous solution, and C is the time-dependent concentration of dye upon irradiation . We can notice that direct photolysis of MO aqueous solution performed under identical conditions is negligible for both samples. It can be noted, that for both photocatalysts, the greatest photodegradation efficiency is obtained at 10 ppm of initial concentration of MO for a catalyst dosage of 1 g L−1 (98% on S-BiOBr, 82% on H-BiOBr). These results are expected because the excessive adsorption of MO molecules on the surface of catalyst at higher concentration (20 ppm) may decrease the degradation rate . On the other hand, the increase of the amount of catalyst from 0.5 to 1 g L−1 leads to an increase of the number of accessible active sites, which increase the amount of hydroxyl radicals produced [58, 59, 60]. In addition, S-BiOBr with its hierarchical structure has higher adsorption capacity which permits more efficient transport for methyl orange molecules to active sites. Furthermore, arrangement of these 3-D hierarchical structures precludes aggregation of particles which is a frequent problem with hydrothermal structure, promotes high exposed area (as seen in Table 1) and better separation of electron and holes which enhance degradation of methyl orange molecules. The kinetics of photocatalytic degradation of MO on S-BiOBr and H-BiOBr has been described by the pseudo- first-order equation ln(C0/C) = kappt, where C0 is the initial concentration at t = 0 and C is the concentrations of MO at time t, and kapp is the apparent rate constant. The values of ln(C0/C) versus irradiation time for photocatalyzed degradation of MO over H-BiOBr and S-BiOBr for each catalyst dosage (0.5 g L−1; 1 g L−1) and for both initial concentration of MO aqueous solution (10; 20 ppm) are shown in Fig. 11a, b. The linear relationship between ln(C0/C) and t confirms photocatalytic degradation process of MO followed by the apparent pseudo-first-order model . The apparent rate constants kapp of H-BiOBr and S-BiOBr are calculated and shown in Table 2. It can be seen that kapp for MO photodegradation on S-BiOBr microspheres is higher compared to H-BiOBr flakes/plates for 10 ppm as well as for 20 ppm of initial methyl orange concentration, which confirms that these hierarchical structures kinetically enhance the decomposition of MO under visible light irradiation. The total organic carbon (TOC) concentration is very significant as it is the ultimate examination to accomplish the required moment when MO has totally degraded and the entire mineralization has been attained [62, 63]. TOC measurements were performed with 10 and 20 ppm of MO solutions at catalyst dosage (0.5 g L−1; 1 g L−1) during irradiation time. As seen in Fig. 12, the mineralization of MO reaches 98% and 96% for 10 and 20 ppm, respectively with S-BiOBr (1 g L−1) compared to 84% and 53% for 10 ppm and 20 ppm on H-BiOBr. 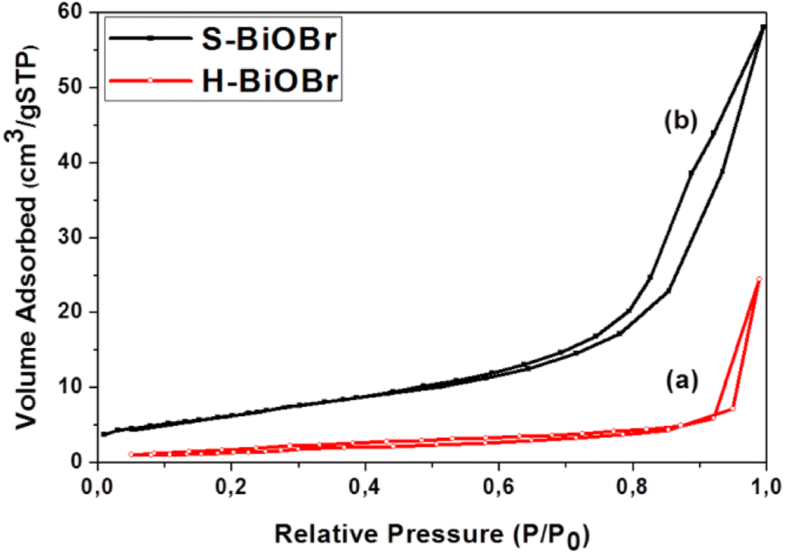 Thus, the efficient TOC removal of S-BiOBr compared to H-BiOBr corroborate the performance of S-BiOBr microspheres to exhibit higher mineralizing ability regardless of the catalyst dosage used. It is obvious from all these results that the superior photocatalytic activities of S-BiOBr photocatalyst are mainly due to the enhanced adsorption–desorption of methyl orange molecules, which principally depends on specific surface area-morphology relationship of catalyst, leading to an effective separation of electron–hole pairs, a decrease in recombination rate and high photocatalytic activity during the photodegradation process . Two types of synthesis routes of BiOBr catalyst were studied and compared to clarify in an efficient way the structure–property relationships under the same conditions of time (6 h) and temperature (160 °C): stirred hydrothermal process and stirred solvothermal process. Structural and morphological studies show a stronger interaction between BiOBr particles obtained in acidic aqueous media by hydrothermal method and ethylene glycol mediated solvothermal way. 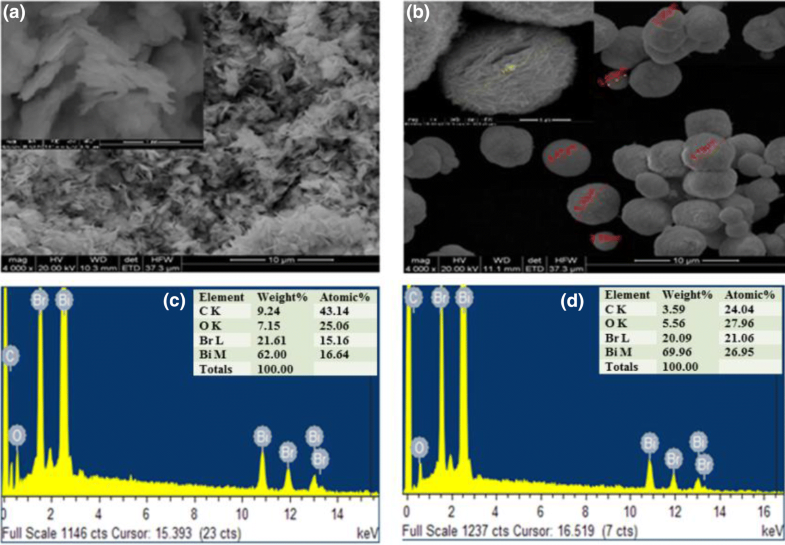 It was found that EG solvent has played a key role in the formation of 3-D hierarchical BiOBr microspheres with enhanced specific surface area and smaller band gap compared to hydrothermal BiOBr flakes/plates. Through the degradation of methyl orange under simulated solar light, the optimum parameters for BiOBr photocatalysts were observed in solvothermal treatment, at initial methyl orange concentration of 10 ppm and dosage catalyst of 1 g L−1. 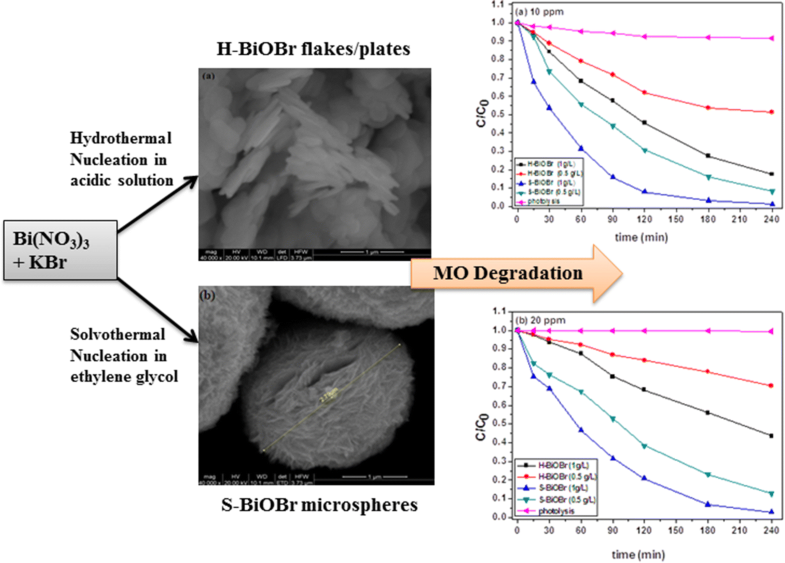 The efficient degradation of MO by BiOBr microspheres catalyst was found to be 98% compared to 82% for BiOBr flakes/plates, as confirmed by mineralization efficiency (TOC). Finally, it was concluded that BiOBr solvothermal synthesized microspheres gave better results for photocatalytic degradation of methyl orange. The authors are grateful for the funding obtained from Université de Tunis El Manar, Higher Education and Scientific Research in Tunisia to achieve this work and acknowledge the support received within the framework of internship at University Rovira I Virgili, Tarragona Spain.